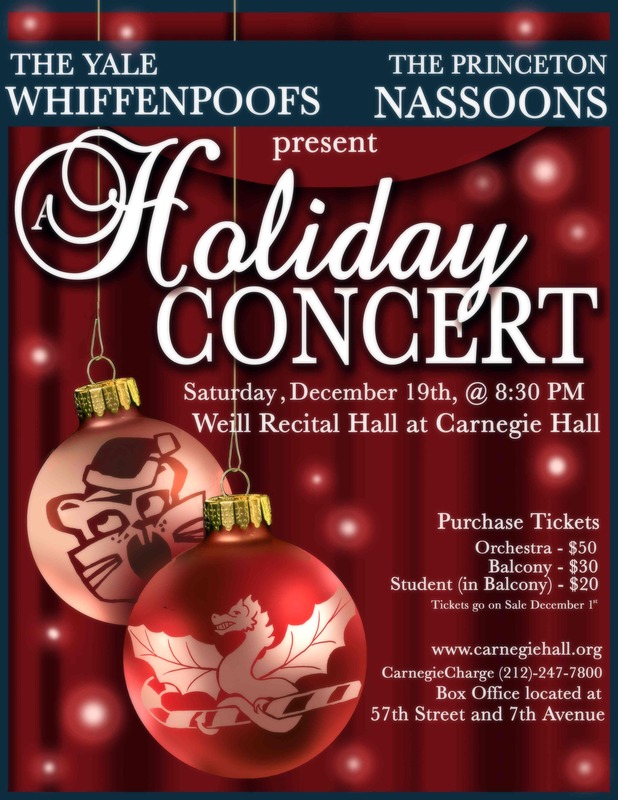 The Yale Alumni Association of Metropolitan New York and the Yale Whiffenpoofs cordially invite alumni to a Holiday Concert at Carnegie Hall on Saturday December 19 for an evening of fine music. The Whiffenpoofs will present some of your holiday favorites alongside classics from the Whiffenpoof repertoire and the Yale Songbook. The concert will also feature the Princeton Nassoons. Purchase tickets online, by calling CarnegieCharge at (212)-247-7800, or at the Carnegie Hall Box Office at 57th Street and 7th Ave. The Whiffenpoofs would like to thank the Yale Alumni Association of Metropolitan New York for co-sponsoring the event.